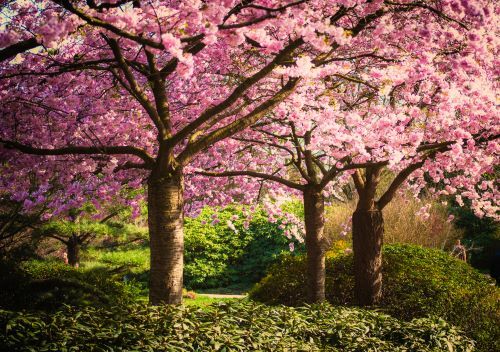 You might be surprised at just how many different flowering trees and shrubs are native to the Pacific Northwest. These plants will add beautiful blooms, color, and diversity to your yard. Even when they are not in their bloom period, they can provide gorgeous fall foliage. Some of them also grow edible berries. Why should you choose flowering trees and shrubs that are native to Oregon? Native plants are better suited for growing in the regional climate and soil. Because of this, they are often more low-maintenance once established. And many of those native to this area are drought tolerant and adaptable to different conditions. By planting these trees and shrubs, you are also supporting native insects, birds, and wildlife. Here are some suggestions on the best native flowering trees and shrubs to plant in your yard. This shrub is a favorite because of the citrusy fragrance emanated by its white flowers. Those flowers bloom in late spring to early summer and the nectar attracts butterflies, bumblebees, and honeybees. The blossoms are also a lovely choice to cut and bring indoors. Its leaves turn a golden color in the fall. Mock oranges are adaptable to different habitats and soil conditions. They grow in full sun to partial shade and moist, well-drained soil. Full sun is generally preferred because it can allow the flowers to bloom more profusely. During the first growing season, make sure to water deeply and regularly to establish the root system. Once established, it is fairly drought tolerant. When planting this shrub in your yard, it is recommended that you place them in the border or with other shrubs as a privacy screen. It should be pruned once a year, right after the flowering period. Also known as creambush, this is a fast-growing shrub that usually grows about 4 to 5 feet tall, but that can reach up to 7 feet. It produces clusters of creamy-white, lilac-like flowers that bloom in the summer. The flowers resemble an ocean wave breaking, hence the name, and have a faint, sweet fragrance. They turn brown and stay on through the winter. The shrub also grows a small, hairy fruit that contains one seed. This is a great choice if you’d love to see some butterflies in your yard. The shrub is a caterpillar host for spring azure, brown elfin, echo blue, pale tiger swallowtail, and Lorquin’s admiral butterflies. It also provides food and shelter for insectivorous birds such as chickadees. Oceansprays are easy to grow, require little maintenance, and are drought tolerant once established. They are adaptable to many different soil conditions and amounts of moisture and grow in full sun to partial shade. And they are not prone to disease or pests. This is Oregon’s state flower and a common understory shrub in forests. In yards, it can be used for hedges, borders, or the back of a garden bed. Oregon grapes will provide color for your yard year-round. Its glossy leaves stay on all year and go from green in the spring to burgundy in the fall. The bright yellow flowers bloom in early March and produce edible, sour purple berries. The flowers attract hummingbirds and mason bees. The berries can be used in jams, jellies, and preserves. And the root bark has been used for both traditional medicines and as a source for yellow dye. This is another drought-tolerant shrub. It can grow in almost any light, but partial shade is ideal. Pruning should be done in the spring. This common evergreen shrub grows to be 3 to 6 feet tall and will be an excellent choice for ground-cover. The dark green, big leathery leaves are often used in floral arrangements. Pink and white blooms that resemble bells are replaced by edible blue-black berries in the late summer. The berries can also provide food for a variety of birds. Salal grows best in partial shade and moist, well-drained soil. But it is also tolerant of different soil and growing conditions. It’s easy to care for after established and relatively pest and disease free year-round. This large shrub or small tree is drought tolerant and can also thrive in seasonally wet soils. You can plant it in a shrub border or hedgerow. Visually, it provides something of interest for all four seasons. White flowers in the spring are followed by small red-purple berries in the summer, then foliage that ranges from yellow to orange to red in the fall. The silver bark looks lovely in the winter. The white flowers provide nectar for birds as well as bees. The berries are edible for humans and can be eaten by birds and chipmunks. It is also a winter browse for deer and elk. A single or multi-stemmed shrub or small tree that typically grows to be about 12 to 20 feet high, this is a favorite because it is tolerant of both sun and shade. Growing vine maples in the shade mean it will need less water, but more sun leads to even better autumn color. Ideal conditions may be morning sun and afternoon shade. Many people love to use this plant in their yards because of that beautiful fall foliage, which turns shades of yellow, red, orange, and purple. Wine-red and white flowers grow in the spring, and two-winged scarlet samara fruits ripen in the summer. The flowers provide nectar for butterflies and bees. Elk and deer will eat its leaves and branches, while the seeds, buds, and flowers are eaten by squirrels, chipmunks, and a variety of birds. Make sure you have enough space in your yard for the flowering trees and shrubs to grow and the right conditions for them to thrive. It is recommended to group drought-tolerant plants together and water-dependent together. Pruning is essential for the flowering trees and shrubs. It encourages new growth, helps maintain structure, and will remove any dead or diseased branches to keep them healthy. But you should usually leave pruning to the professionals. The highly trained, certified arborists here at Mr. Tree. have the expertise to make sure pruning is done as safely and effectively as possible. You can find information about our pruning services and more on our website.